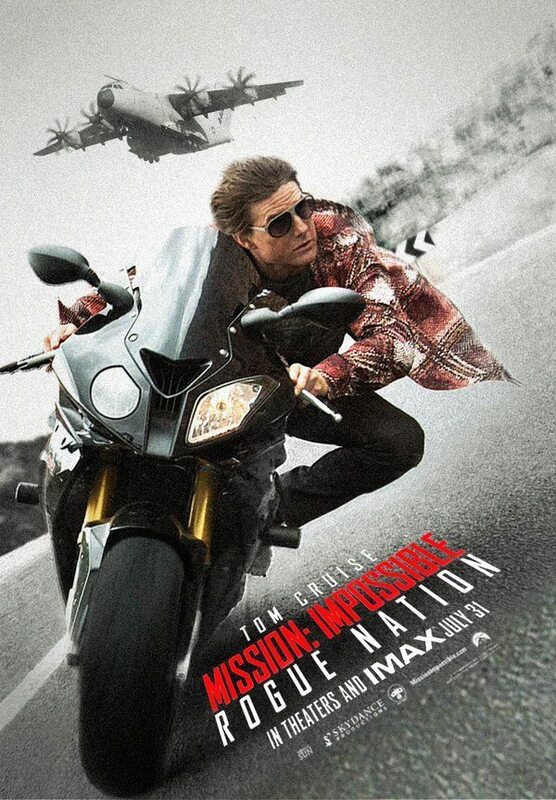 Now that Mission: Impossible – Rogue Nation is finally out (as I have been waiting for it), I will get to see if Tom Cruise, at 53 years old, still has what it takes to deliver the incredible action scenes that Mission: Impossible is known for. Can Tom Cruise still play super-spy, Ethan Hunt, convincingly? Can the franchise continue to be successful after the 5th film? Are the stunts and effects up to par? Does it deliver a interesting, good, and quality story? Let me dive in and explain my take on Rogue Nation. First, let me review who is returning to paint a better picture of what you can expect. Tom Cruise – Returning as Ethan Hunt. In the past, Tom has done a great job wit this character (in my opinion). Can he still deliver? Simon Pegg – Returning as Benji. Personally, I think Simon Pegg is hilarious and love that he is returning for this movie. If you don’t recognize him, watch Shaun of the Dead or either of the two most recent Star Trek movies, where he plays Scotty! Jeremy Renner – Returning as Brandt. Who doesn’t like Hawkeye (Avengers) and Aaron Cross (Bourne Legacy)? Ving Rhames – Returning as Luther. An original member of the team from Mission: Impossible (1996). Rebecca Ferguson – A new addition to the franchise playing agent Ilsa Faust. Alec Baldwin – Also a new addition to the franchise. He is playing CIA director Alan Hunley. Okay, so first, I should predispose you to the fact that I am a fan of spy movies and have enjoyed most of the previous M:I (Mission:Impossible) movies. That said, I did go see this movie with relatively high expectations and, thankfully, they were met. I thought this was a very fun and entertaining film. Initially, I was concerned that the series was running dry and that they would likely not be able to replicate the enjoyment factor that the previous M:I film had, Mission: Impossible – Ghost Protocol. I was also worried that Tom Cruise would not be able to handle the action as well as in the past. My mistake on both parts. Let me begin with Tom Cruise. Again, I had concerns about his ability to do action (given his age). This is in no way a “jab” at Tom Cruise as it is common for many actors to have stunt doubles handle their work at much younger ages. Actually, aside from all the bizarre mishaps in his personal life, I like Tom and think he is one of the few actors that delivers a good performance pretty consistently. After, hearing that he actually performed the stunt of him holding on the plane as it took off (a popular scene in the movie and all the trailers), I have to tip my hat to him and say “congrats”! Tom Cruise is still as good as ever and I am still a fan. This movie, like all M:I movies, has a lot of spectacular actions sequences. And they deliver! Whether its Tom hanging on to the outside of a plane as it takes off, an incredible car and motorcycle chase, or a good ol’ fashion brawl, this movie has it! At no point, does the movie delay the action or rest so long you begin to lose interest. If you aren’t being thrilled with action you are being awed by cool technology or having a good laugh (thank you Simon Pegg, you rock). Aside from Tom’s great performance, you have Jeremy Renner. Sadly, this is one area that I felt like the movie suffered. Not because of Jeremy Renner, but the lack of him. More specifically the lack of action from him. Which is pretty nonexistent, unfortunately. After his great role in the M:I – Ghost Protocol, I was really hoping to see more “secret agent” kind of stuff from him. I really hope that they expand his character’s role in the event they make another M:I. However, to make up for that mistake, Simon Pegg’s character, Benji, got a little more action and a lot of humorous scenes which definitely added to the movies overall appeal. Ving Rhames played his characters fairly limited part perfectly. That’s okay I guess but it would have been nice to see him do a little more in the film. Alec Baldwin is a excellent at portraying an irritating jerk and does so in M:I – Rogue Nation. At first you don’t like him and kind of see him as a thorn in the IMF’s shoe but, later near the end of the film, you kind of enjoy his scenes and appreciate his character. While he had limited screen time, he was a very welcome addition and I look forward to seeing him re-appear in the next M:I installment. Now, the big surprise is the relatively unknown, Rebecca Ferguson. WOW! She was incredible and easily “carried her weight” while sharing the screen with Tom Cruise. At no point, were her action scenes less entertaining or powerful than Toms. She should easily be considered the main co-star (along with Simon Pegg). Not only was her acting on point but she handles action like a veteran. Her fight scenes were arguably the best in the film (no offense, Tom). I can definitely see her being cast in more action type films as she clearly has the talent for it. Before the movie, I had never heard of her. Now, I believe it won’t be long before everyone knows her name. She could easily be considered the new Scarlet Johansson. Anyway, don’t let the idea that you might not know her face/name deter you from seeing this movie. She was amazing! So, Your mission, should you choose to except it – go to the movies and watch Mission: Impossible – Rogue Nation, and determine if you believe Tom Cruise still has the skill to play the super agent/spy, Ethan Hunt, in the latest iteration from the hit franchise, Mission: Impossible. Is the movie worth seeing at the theater? Yes. Can Tom Cruise still play super-spy Ethan Hunt convincingly? Indeed. Is the action scenes/stunts on par with previous M:I movies? Yes… and then some. I have heard people say previous M:I movies were hard to follow so let me say this: at no point, was the story ever hard to follow. You will not get “lost” in back-n-forths or intricate details. You will understand everything from start to finish. No big questions will be left at the end. Personally, I thought this was a great movie. To be honest, looking back, I think this may be my second favorite summer movie, behind Jurassic World but ahead of Furious 7 and Ant-Man. Yeah, I just said that. This message will self destruct in 3 minutes (enough time to watch the Mission: Impossible – Rogue Nation trailer below). My overall rating: 4.5 out of 5 stars. Jeremy Renner's presence is too small.